It was below freezing cold in total darkness in the middle of a desert in the winter solstice. 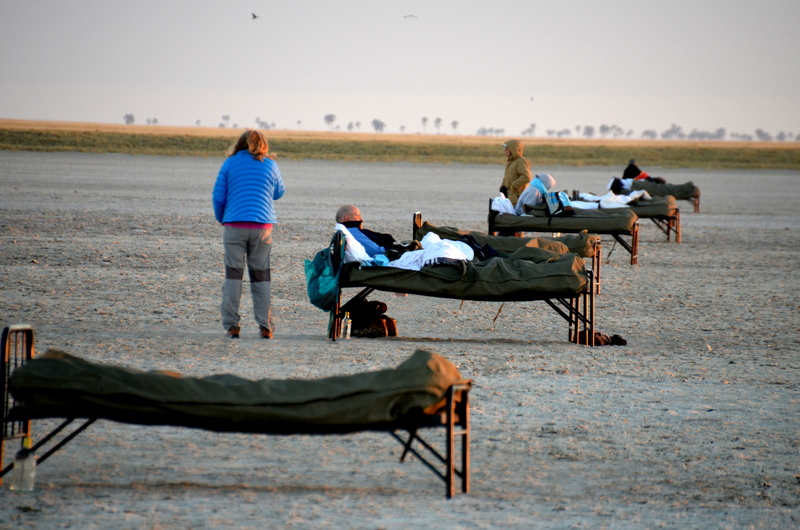 We were sleeping alone in our beds out in the middle of the Makgadikgadi Salt Pan with just the constellations of Libra, Scorpio, Sagittarius and Capricornus, the Milky Way, the Southern Cross, Saturn, Mars, Venus, the Crescent Moon and the Seven Sisters all dazzling down at us like diamonds. 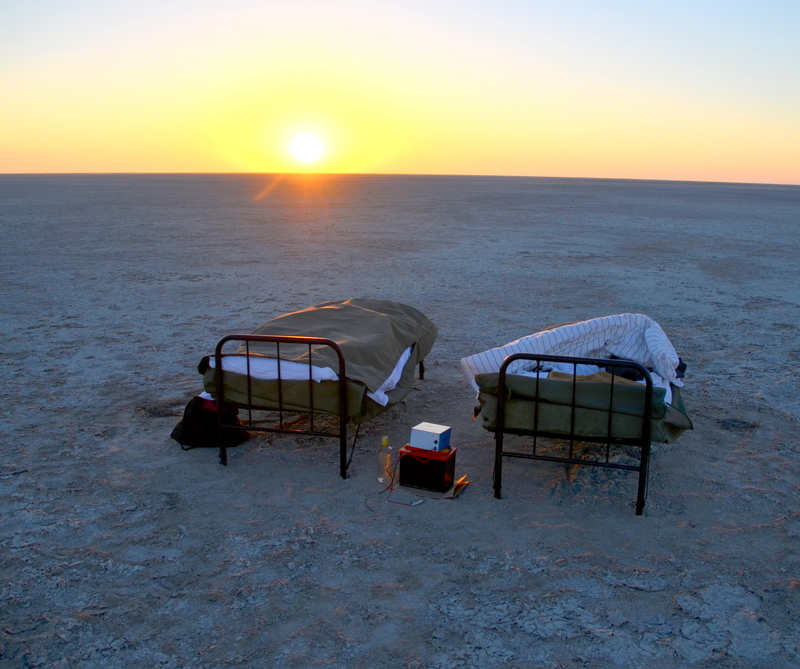 Our metal beds sat on top of a huge field of salt with a sleeping bag on top. Crawling into the sleeping bag under 4 heavy layers of comforter, blanket, sheet and the bag were so tight we could barely get in, much less turn over. 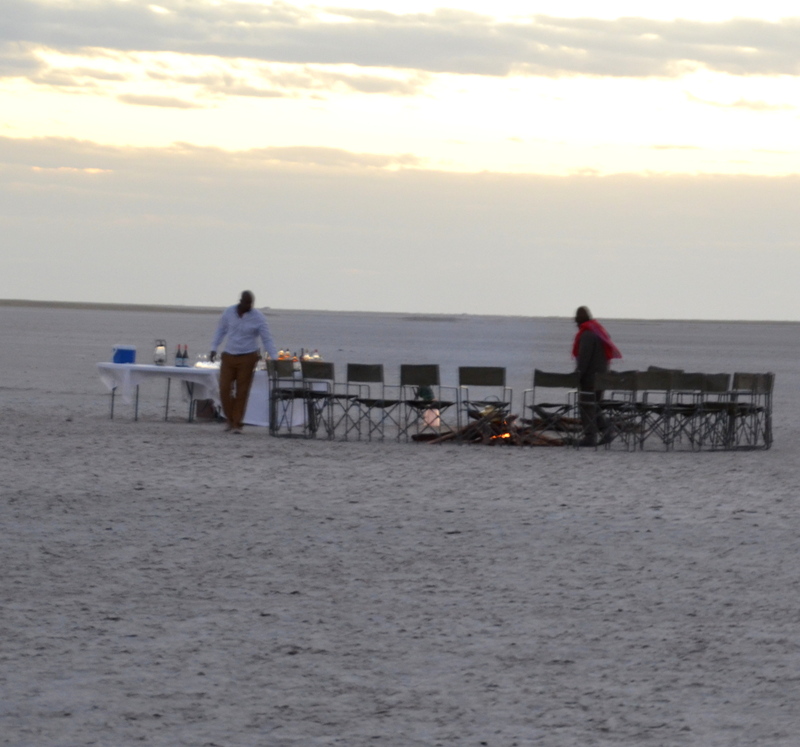 Plus, I had on 5 layers of clothes and a fur hat because it was below freezing cold in June in the winter in the Kalahari Desert in Botswana in the Southern Hemisphere. 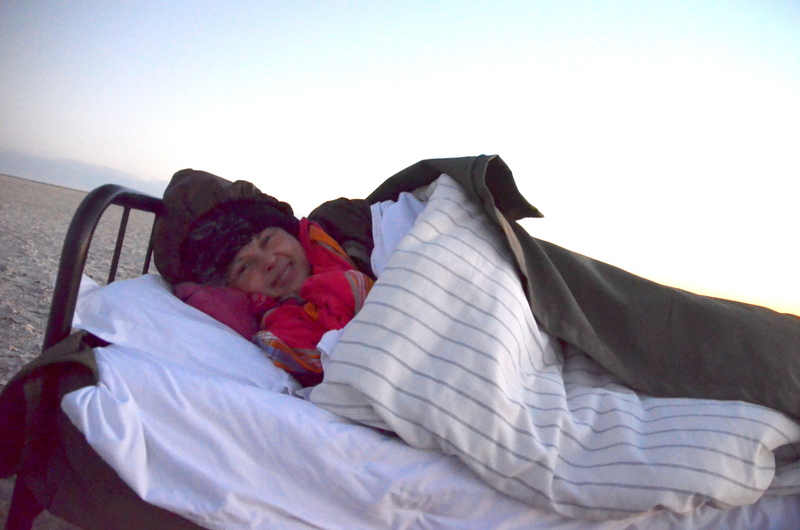 I must be crazy to do this, I thought, as I made myself get into the ice cold bed with 2 Bush Babies (hot water bottles) fully clothed all alone in the desert. It reminded me of my early days on the farm when I had to do the same thing in the winter. And then, I vowed I would never live like that again. 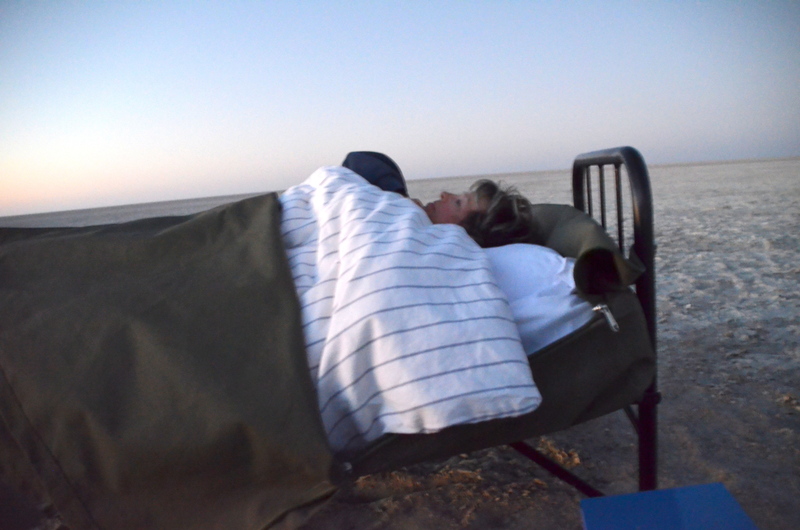 Yet, I was doing it again because I always dreamed of sleeping in a desert just once. 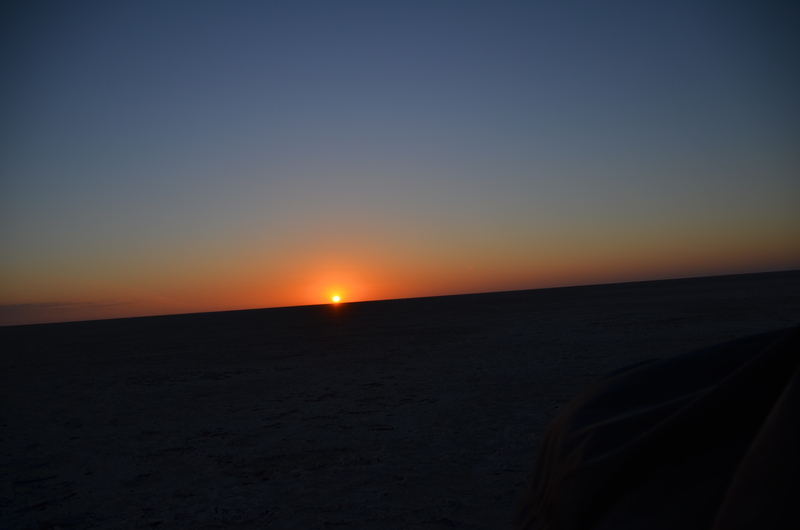 But this was a very special time to be in the Kalahari Desert because it was the winter solstice with the Matariki as the Maori call the beautiful star cluster in Taurus. It is also called the Seven Sisters or “the Pleiades” by Europeans. Libra, Scorpio and Sagittarius were particularly distinctive. During the winter, the Sun is low in the daytime sky so any planets opposite the Sun are nearly overhead during the middle of the night, providing the best viewing of the year. And they were. Saturn and Mars and everything else in that night sky was so sharp, bright and clear that I felt a special connection to them. When I was growing up on the farm far from a city in the Northern Hemisphere, my Daddy would have us spend several times a year in the total darkness to look at the wonderful sky full of constellations, planets and everything else. 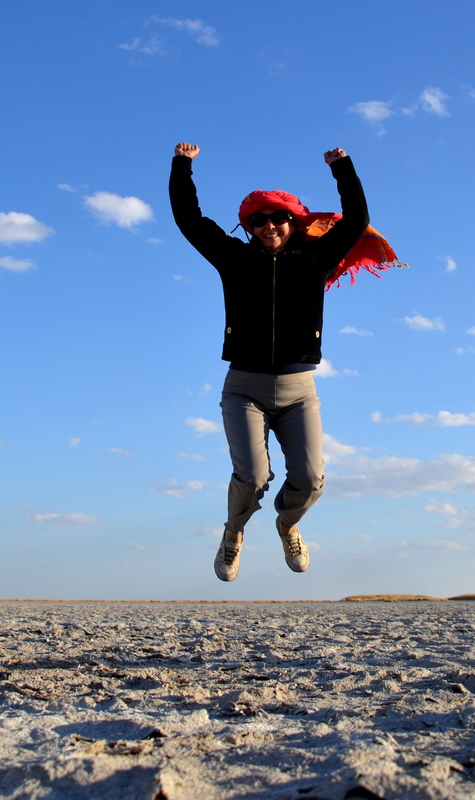 And I never dreamed I would do it in the Southern Hemisphere in a desert in a Salt Pan. All of our tour members agreed to sleep in the desert. 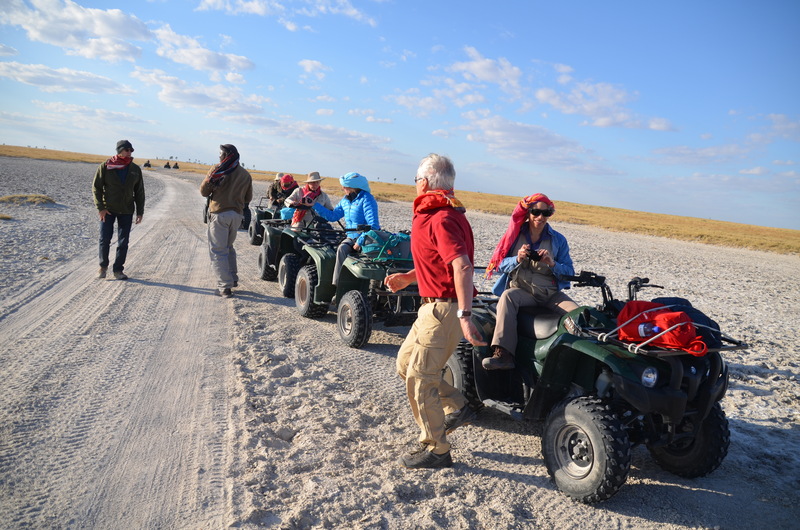 To get to the Salt Pan from our Camp, we rode 4-wheeled ATVs in convoy. 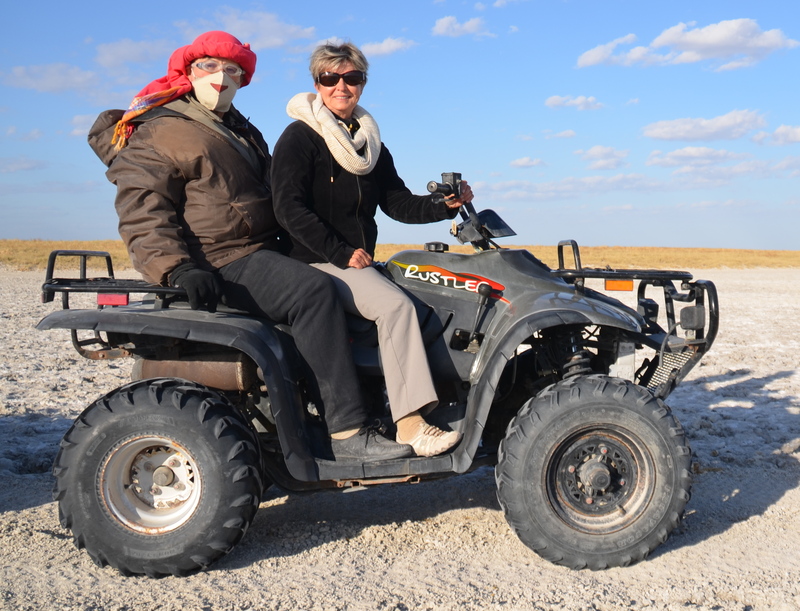 June, my travel companion, drove the ATV while I hung on in the back with my face and head covered to keep out the dust. Cruising along at 25 MPH, I was hoping the entire time that I would not fall off as riding a dedicated path in the salt pan at 25 mph was a little bumpy for this first time ATV rider. But it was awesome, exhilarating and like the freedom of riding a motorcycle. After 10 minutes, our guide stopped to make sure all was going OK with us. 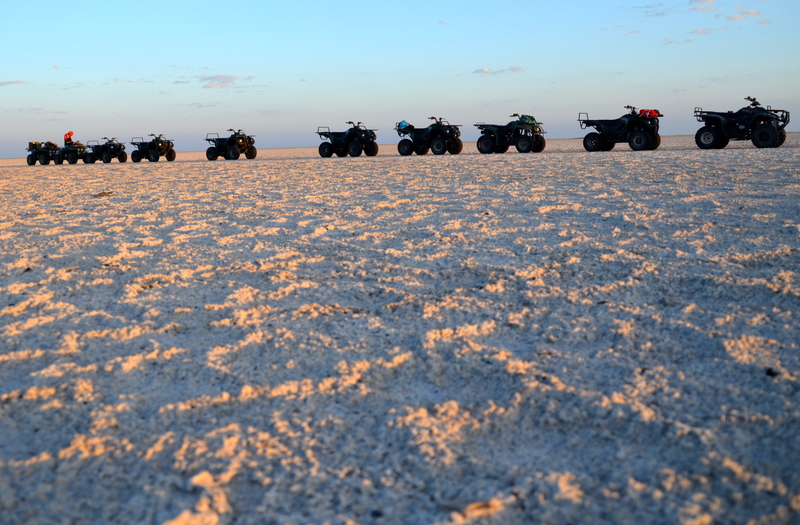 It was, so we proceeded through the Salt Pan at 25 mph, riding in the middle of nowhere. On our next stop, our guide had us jump in the desert while he took a photo. 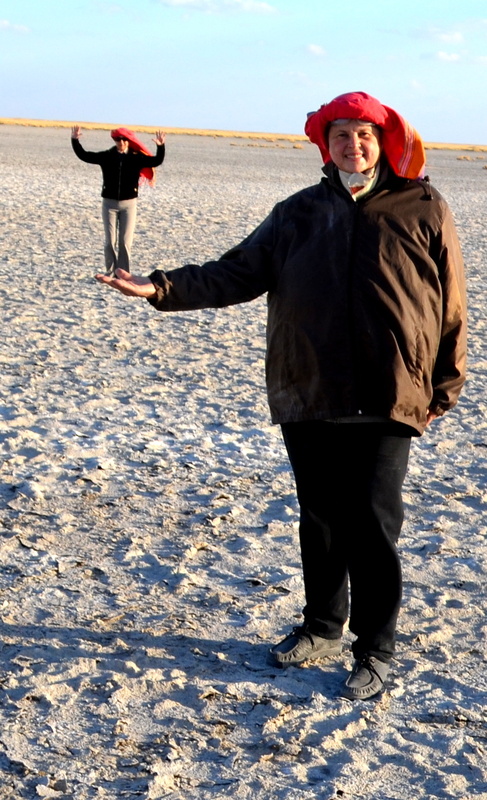 Since I didn’t jump, my guide took our photo together and the photo was a wonderful surprise. Then it was back on the ATV at 25 mph for 10 more minutes. 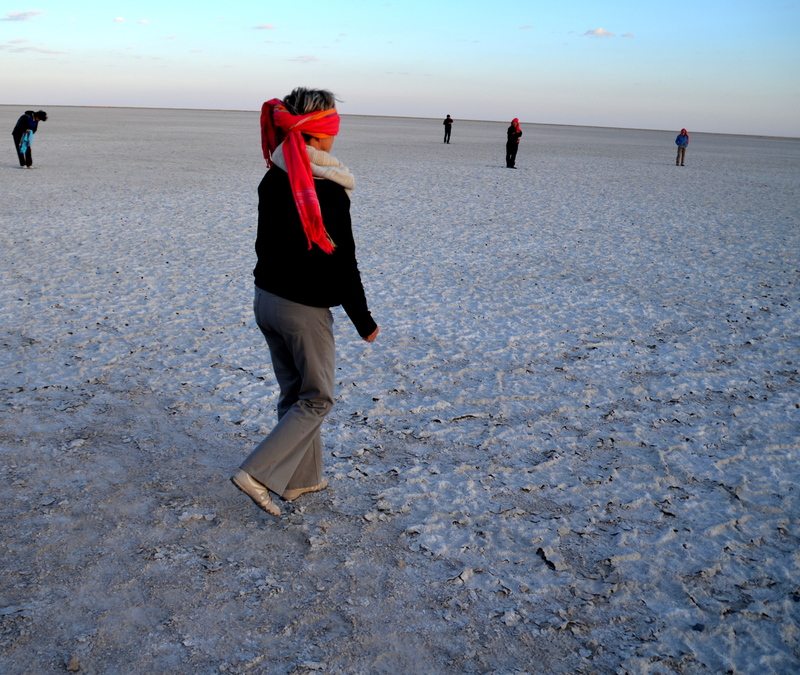 Stopping again, our guide put a backpack 200 feet from us in the Salt Pan and then each agreeing person was blindfolded and had to walk to the backpack. Everyone ended up many feet away from the backpack, showing how humans lose all sense of direction when they do not see a landmark in the dark. This was to demonstrate the importance of placing our flashlight on the bed facing the toilet so we could follow our light beam back to our bed from the toilet in the middle of the night, if the need arose. 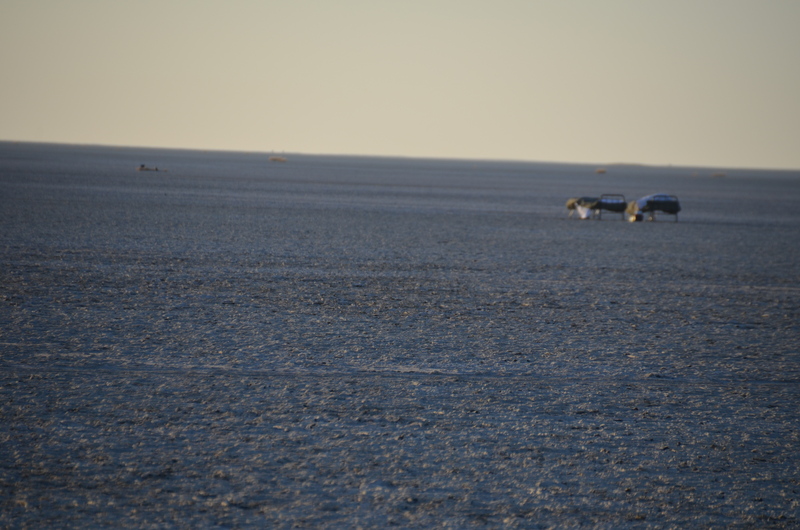 After our next 10-minute ATV ride, we stopped for an incredible experience of sitting alone over 100 feet apart on the floor of the Salt Pan facing the Sun. 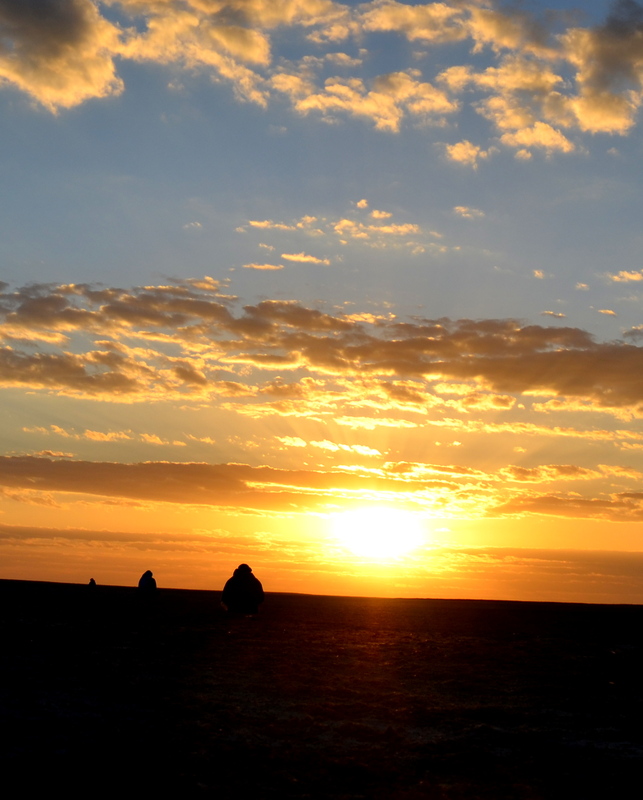 Our assignment was to watch the Sunset in total silence, alone. It was beautiful, eerie, different, a special time to communicate with God, and to meditate as the sun sank into the horizon. Back on our ATV, we headed to our final stop, our “home in the desert” for the evening. Waiting for us was an area for cocktails by a huge fire, dinner by candlelight with white tablecloths, glassware and candles, a toilet, and our beds, all very far away from each other. Even farther away from all of this was the “kitchen” which the Lodge had set up to serve us. After cocktails, we headed for the dinner table in the below freezing winter night. But then we weren’t as cold since our waiter placed a shovel full of hot coals from the nearby fire under each person’s chair. Instantly, it was warmer and a much appreciated touch. 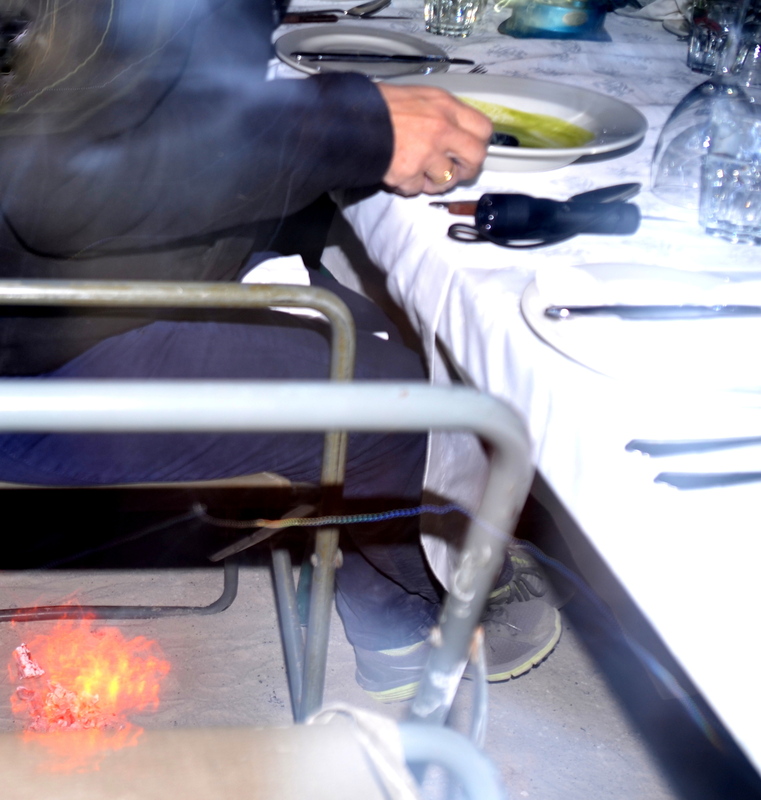 And the delicious hot soup, hot main course and dessert made us even warmer and ready for our sleep in the desert. 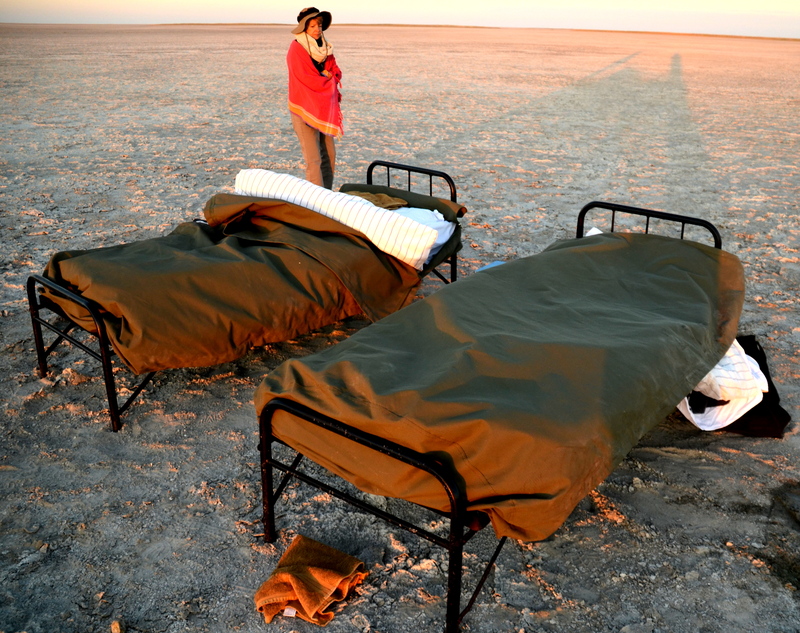 Our beds were waiting for us all alone in the Salt Pan. And now was the moment we had waited for so long. Amazingly, we slept soundly and warm all night and awoke at first light just in time for breakfast. 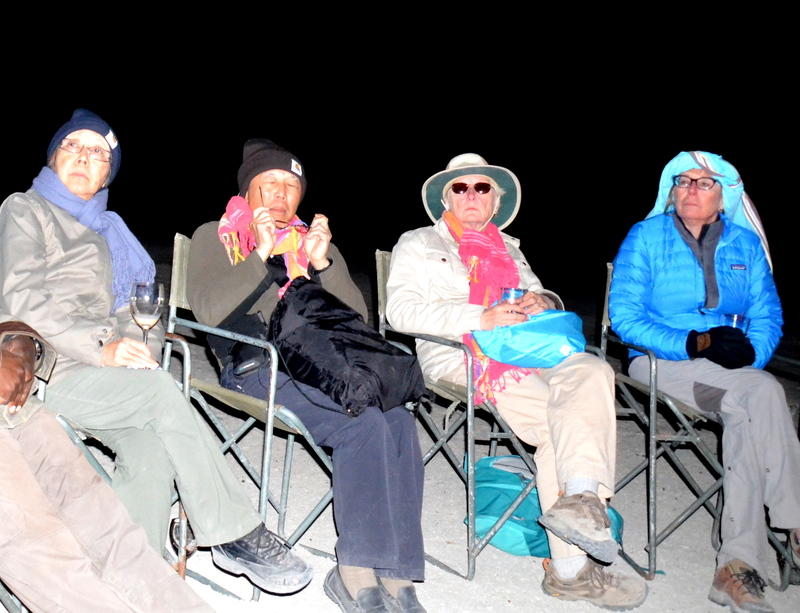 And we were happy, thankful, pleased and at peace with our once in a lifetime winter experience in the Makgadikgadi Salt Pan in the Kalahari Desert in Botswana.